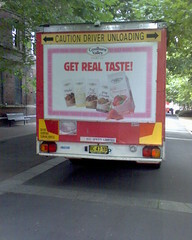 On the back of a Coca Cola delivery truck I walked past the other day was an advertisement for the new Goulburn Valley Dairy Co flavoured milk. ‘Get real taste‘ it proclaimed. Well, at the beginning of November, due to a shortage of Oak milk at Woolworths, I purchased some of this new flavoured milk. Not my best decision, but I can put it down as ‘taking one for the the team‘. This brand is not something I would recommend. Actually it is something I recommend against. The taste was rather bland and dry. And not smooth like Oak. More like compound chocolate. After talking to a manager at one Woolworths I hear that head office management has decided to delete Oak milk, ie not stock it in Woolworths stores (the 375 ml and 600 ml sizes at least). And I was not the first to complain to this manager. I speculate that there has been some commercial deal between Woolworths and Coca Cola, where the new Goulburn Valley milk varieties take the shelf space once occupied by Oak flavoured milk. A strange move considering the Oak milk, especially chocolate, always seemed to sell out before other brands. But I can’t be expected to understand the nuances of this corporate decision making process. I’ll just have to go to Coles for my Oak chocolate milk in future. This entry was posted in Photos, Shopping and tagged chocolate milk, CocaCola, drink, flavoured milk, food, photo. Bookmark the permalink.